(1947-2017), Paris, Hazan, 18 octobre 2017, 176 p (with contributions by Clara Bouveresse, Tatiana Debroux, Alexis Fournol, Alain Marciano, Jérémie Molho, Nathalie Moureau and Marion Vidal). Founded in 1947 by a group of Parisian merchants (Louis Carré, Gildo Caputo), the Professional Committee of Art Galleries (CPGA) was originally intended to be a lobbying body vis-à-vis public authorities and elected officials, a space for collective thinking and sociability for Parisian merchants and a place for the emergence of proposals for tax, legal and economic reforms of the French art markets. Its history reflects that of the art markets and presents an effective key to analyze major issues such as the regulation of trade, the definition of original works of art, the defense of the French art market or even contractual relations with artists and collectors. This book is the result of multidisciplinary research based on unpublished archive material and numerous interviews. 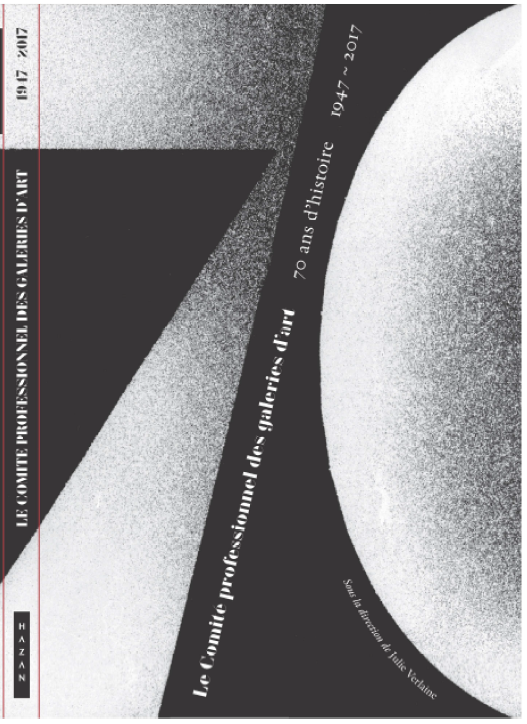 It examines thehighlights of the activity of the CPGA during its 70 years of existence and places the CPGA in the broader context of the market’s growth of the world of contemporary art. The book is now available from all good bookstores.